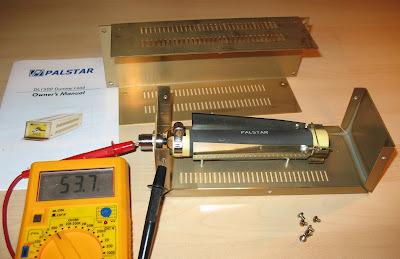 Today I received my 1.5 kW dummy load made by Palstar. The model I ordered is DL1500. This dummy load seems to be very well made and it is very light too! I needed something smaller than those heavy oil-filled loads made by Bird. The resistive element in the dummy load is a single (custom-made for Palstar) ceramic-composite resistor. The resistor is fairly large, runing along the length of the enclosure and it is clamped between the SO-239 connector and the bottom part of the aluminum enclosure. DC resistance at room temperature is about 53.7 ohm (the meter is calibrated). This agrees with the factory specifications of 54 Ohm +0/-5%. Most dummy loads measure higher-than-nominal resistance when cold and the resistance drops with increase of the temperature. At working temperature of 70-90 degrees Celsius the resistance is exactly 50 ohms. Further heating will drop the resistance a little below 50 ohms. We are talking DC resistance but judging by the construction, the reactive component should be minimal at HF. There is a metal hyperbolic cone around the ceramic resistor. The cone is mounted on aluminum stand-offs and it is used to correct the reactance component of the impedance at higher frequencies (especially on 6 meter). The enclosure is made from perforated anodized aluminum sheet. The RF connector is of silver/teflon type. The resistive element is held in place by two stainless steel clamps. My MFJ-259B shows resistance of 52 ohms and reactance of X = 4 ohms for SWR 1.1:1 at 54 Mhz. At 14 Mhz the reactance drops to 2 ohms and R is exactly 53 ohms. Considering that the MFJ259B is not the most accurate instrument in the world - it should be just OK. 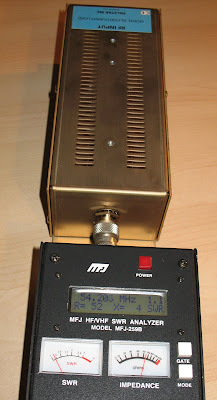 This load is rated up to 500 Mhz but I am planing use it only on HF. I think the real characteristics are even better than what 259B shows! I'll take more accurate measurements with my Telepost LP-100 soon. At first glance DL1500 seems to be an excellent product and I am happy with it. A note of caution - this dummy load can take 1.5 kW power but only for up to 10 seconds and 100W for up to 10 minutes! Modifying the load for forced air cooling (installing a fan or two) will improve these numbers but breaks must be made between the intervals of high-power usage!